Music for Yoga, Reiki etc. Keary’s CDs playing in the background during the yoga classes at my studio have proven time and time again to be ideal for setting a very relaxing atmosphere. I wouldn’t be without them! —Gail Leslie, owner of the Dancing Cat Yoga Centre, New Westminster, BC. “It’s beautiful, it’s us.” —Cindy, buyer for The Omega Centre, Toronto, Ont. I have 3 cds of music that is excellent as accompaniment to any kind of healing/body work such as yoga and reiki. The music is spacious and relaxing but also active and heart-opening. It also works effectively for journeying into deep spaces in a meditative way. This site, stephengrayvision.com, is dedicated to the work associated directly with the writing. I have another website, www.keary-reedsong.com, where you can listen to two-minute long demos of several pieces from each of the three cds. If you wish to purchase any of the cds or individual songs, the website will link you to cdbaby.com, or you can use this cdbaby link to go directly from here. 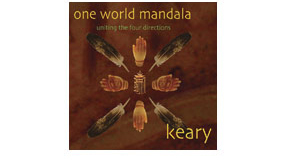 The three cds, The Secret Gate, The Open Path, and One World Mandala, under the artist/group name Keary, can also be found at iTunes, where you can listen to shorter demos of every song on each of the cds. If you do purchase any of my music, please contact me and let me know about your experience with it, what kinds of situations you use it in and so on. If you would like to provide a testimonial or user review that I could use on the site I would be most grateful.